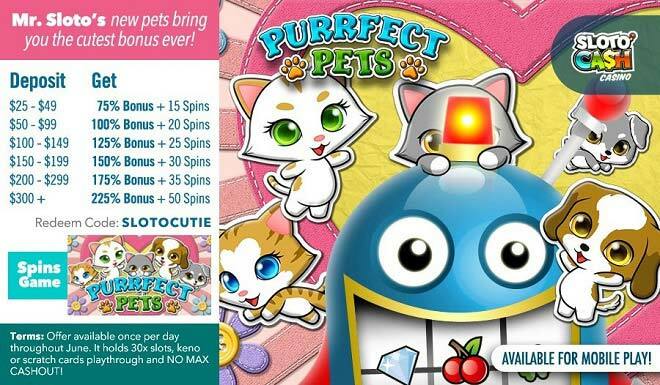 Mr. Sloto’s New Pets Bring You the Cutest Free Spins Bonus Ever! Whenever you think about cuteness your mind immediately turns to babies, puppies, kittens and the sorts. Right? Well, this June it will turn to bonuses, free spins and Purrfect Pets! Make it a month of adorability when you deposit $25 that will grant you up to a 225% Match plus 50 Free Spins! We know you're a slot lover - and you'll love Purrfect Pets when you find all about the Doggy Dollars feature that's triggered when landing 3 or more scattered Dog symbols. During this round prizes are doubled and scatters act as additional wilds! Mr. Sloto foresees that June will be filled with the cutest four-legged friends that will bring huge wins and lots of fun!